At least, that’s what folks in Oakland County are saying. And especially those near the Greenhouse in Walled Lake – which has the distinction of being the first licensed dispensary in Oakland County. Up until now, residents of Oakland County have had to go to provisioning centers in neighboring counties. And some of those dispensaries haven’t felt exactly welcoming. Jerry Millen, one of the owners of the Greenhouse, has set out to change that. Back in October when Millen was granted the first license in Oakland County, he was thrilled. And more than a little relieved. Having decided eight years earlier that he wanted to open a dispensary, he bought the Walled Lake building that houses the Greenhouse four years ago. And although he was granted the license three months ago, he was in no rush to get the Greenhouse open right away. After all, he’d already been working on the building for years – his objective being to create a dispensary that would feel more like a mom-and-pop corner store and less like a low security correctional facility. Of course there were other reasons he didn’t open right away too. One of the key reasons being the lack of marijuana. He didn’t want to open until he was certain he’d have a sustainable supply of a variety of products, and that he’d be able to sell them at a fair price. What Will This New Dispensary in Oakland County Offer? 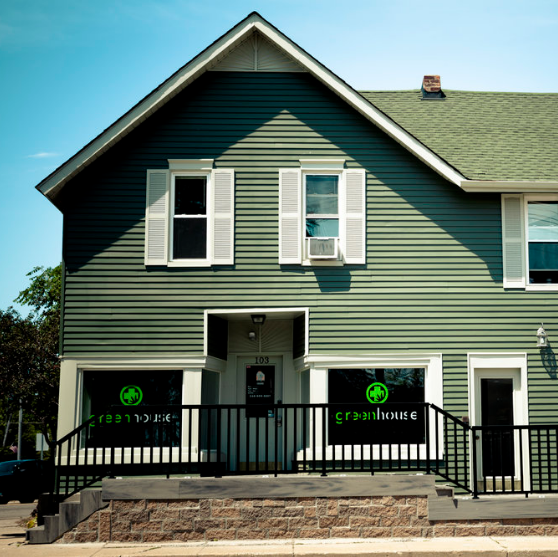 One of cool things about the Greenhouse is its proximity to Over the Moon – the most recognized and respected medical marijuana certification clinic in the metro-Detroit area. For several years, the clinic has been helping medical marijuana patients get their patient certifications. They specialize in helping patients recognize what type of marijuana is best suited for their specific needs. Millen feels it’s really important that patients understand the benefits of marijuana and it many uses. So he’s planning to offer a series of seminars educating current marijuana users and prospective patients on the benefits of different kinds of marijuana and how to best utilize them. There will be doctors and patients at the seminars who will be able to speak firsthand of the benefits of cannabis. This is unique approach, to be sure. But Millen is passionate. And this passion carries over to understanding the benefits of medical marijuana for children suffering from debilitating diseases. The stigma around marijuana use for adults is still prevalent. So it makes sense that there’s so much resistance to using it for children. But it sure beats opioid drug use – which is also not favored by parents. So through these free classes and seminars, Millen plans to help people understand how to continue to use marijuana safely with their children, while lifting the stigma around it. Millen and the Greenhouse are setting to bring together the community of Walled Lake in a whole new way. As enlightened on the topic of cannabis as Millen and Walled Lake might be, don’t expect a slew of other dispensaries to open in Oakland County too soon. We have to remember that statewide, voters approved Proposal 1 by a 56-to-44 margin. So that means even though 2,356,422 voted yes, there are 1,859,675 people who voted against it. So it shouldn’t come as a major surprise that not every community is embracing the possibility of marijuana businesses in their communities. Even in Oakland County. For example, the Rochester City Council members voted 6-1 to approve a measure that would prohibit marijuana businesses from being established within city limits. On November 12th, the Birmingham City Commission voted 4-1 to ban establishments selling recreational marijuana within the city’s boundaries. And even Royal Oak – a community riddled with bars – the city commission narrowly passed by a 4-3 vote to ban marijuana facilities while officials explore how they could potentially impact the city. Seems there will always be push back. But the Greenhouse is proof positive that the cannabis industry is moving in the right direction. And that’s onward and forward. If you’re all about supporting the cannabis industry, swing in and visit the first licensed dispensary in Oakland County this weekend and see what it’s all about. And since it’s Super Bowl weekend, if you wear any NFL team jersey (and we mean ANY), you’ll get 20% off your purchase at the Greenhouse.